You never know who might move in next door -- a cute girl, a pair of elderly swingers, or a disapproving Samuel L. Jackson aggressively determined to breakup your interracial relationship because of deeply buried demons he later tells you about at a bar. 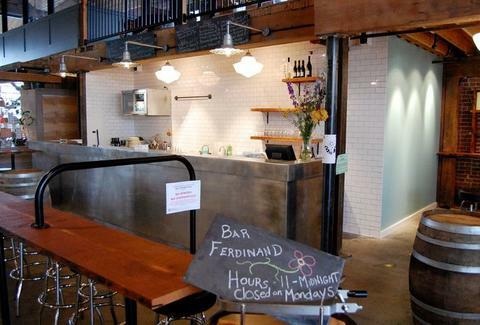 From a crew that knows exactly what's next door, Bar Ferdinand. From the guy behind The Corson Building, and next door Sitka & Spruce (plus two other partners), this final addition to the Melrose Project is a small-platery/wineshop with an eat-space that boasts an oversize stainless bar with white-tile-backsplash, butcher block high-tops, and an authentic black/steel dining stooled oak barrel; the brick-walled retail side's got bottles of vino to take home or, for a corkage fee, on-location drinking, which is also what Mel Gibson calls every movie he's ever made. Drinkwise, they've got a wide selection of international/hard-to-pronounce wines ranging from a 2006 Vin d'Alsace Pinot Noir, to a 2009 Domiane Tempier Bandol, to Barberani Grechetto, and a rose number called Raffault Chinon, all of which are produced in boutique batches using techniques that're eco-friendly, but not Ecco-friendly cause no one wants to be nice to a lame dolphin. BF's mostly snack-size grub includes Jamon Serrano; Tuna in Oil w/ a six-minute egg; Boiled Spot Prawns & aioli; as well as preserved Puget Sound smelt, which totally delt. BF's also offering up a limited selection of simple 'tails (hard stuff mixed with soda/juice) and, in the future, a happy hour that will involve free food -- though no matter how much you offer it to Sam at your house warming party, he's still slashin' the tires on your Prius.